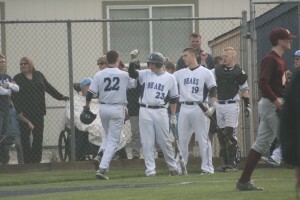 Cameron Frost (#22) is congratulated by Elliot Loaque (#23) Michael Fairchild (#19) and Max Stottlemyre (in catchers gear) after scoring a run during the Bears victory over South Kitsap earlier this week. Baseball, like all other sports, is an extremely simple game, and yet, at the same time, is extremely complicated. A pitcher throws the ball to the catcher, the batter swings, and a result happens, whether it’s a strike or a hit. However, there are many other factors going on at each moment – what type of pitch was thrown, how far is the base runner leading off first base, what gap is opened up by an outfielder shift? The amount of information continually processed is staggering, and, in most situations, doesn’t allow for thoughts involving life outside the diamond to creep in. 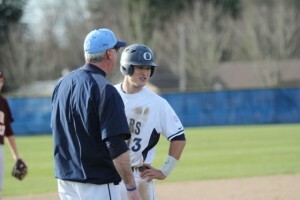 Senior shortstop Leo Valenti gets some advice and a laugh from interim head coach Greg Creighton. Creighton is filling in for 19-year head coach Todd McDougall, who is undergoing treatment on a brain tumor. This is not the case for the 2013 Olympia High School baseball team, the school’s first team not led (on the field) by Coach Todd McDougall since 1993. McDougall was diagnosed with a brain tumor in December and has been undergoing extreme treatment ever since, leaving the OHS baseball team in the hands of longtime assistant, and former head coach, Greg Creighton. Creighton will serve as interim coach this season, with the title of head coach still belonging to McDougall. 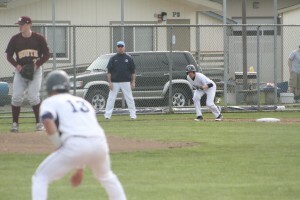 As five time defending 4A Narrows League champions, Olympia appears to have all the necessary talent required to make a run at another league title and deep into the playoffs. However, they must cope with their coach’s illness together, one day and game at a time. Knight is one of six returning first or second team All Narrows League performers for OHS, including seniors Gabe Padukiewicz, Cameron Frost, Leo Valenti and Michael Fairchild and junior Leif Hansen. This experienced talent base gives Creighton a lot of optimism heading forward in 2013. The Bears must stay focused in order to make a deep playoff run, something they did not accomplish last year. 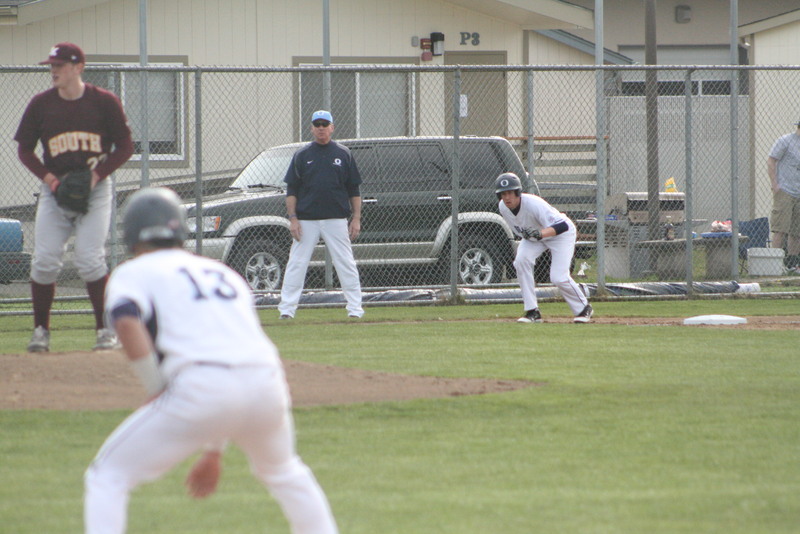 With runners on first and third, the Olympia High School baseball team puts pressure on the South Kitsap pitcher during a Bear’s victory on Monday, March 25. Armed with a talented roster that has the ability to drive in runs, the Bear’s will also use their base-running ability to generate runs. Having such a balanced roster with high level collegiate talent (Frost is committed to play for Washington State University next year) gives the Bears confidence. They know that on any given day, it could be any player that comes up with a clutch hit, a big catch or a heads up play running the bases. “It’s tremendous to know that if I can’t get the job done, I’ve got a host of guys behind me that can,” Knight said. Across all sports, Olympia High School has a reputation for high level performance, which can go to an athlete’s head and lead to uninspired performance. This is not the case for the Bears baseball team, as Creighton knows the squad is willing to put in the work to live up to that high standard. Already equipped with a strong inner drive, it appears the Bears will have extra motivation all year long, as the game will give them the therapeutic opportunity to play for their ailing coach all season long. “I think the whole thing is showing what this team is all about, how we care for each other,” said Hansen. For more information on the Olympia High School baseball team and how to help coach McDougall in his fight against cancer, click here.